This post was inevitable. Why? Because tourists in Ireland inevitably end up at Blarney Castle. Because it is part of the “Irish experience” to lean out over the void and kiss the Blarney Stone, thereby augmenting one’s eloquence and sharing a (germ-y) tradition with the million and one people who came before. So, today it was my turn to give the Blarney Stone a smooch. For €6.50, I got a round trip bus ticket from Cork to the town of Blarney, a tourist trap that comes across as a charming country village. The bus let us off at the woolen mills. I admit, I didn’t look very hard for any actual mills, since Blarney Castle was my final destination, but I did have an opportunity to stroll through the woolen mill store. It was stocked with beautiful sweaters, hats, scarves, and more, all made from wool and/or alpaca and all well out of my price range. 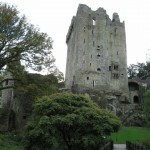 Having come to that fiscal conclusion, I headed down the street toward the grounds of Blarney Castle. The area has been an historically desirable spot. First built upon in the tenth century, stone architecture was introduced to the site in the 1200s before Dermot McCarthy, King of Munster, oversaw the final construction of the castle in 1446. The name “McCarthy,” far from having the cringe-worthy reputation it holds in the U.S., is a power name in Munster. Indeed, the McCarthys held the property prior to 1446, however, for Cormac McCarthy occupied it when he supplemented Robert the Bruce’s army with four thousand men in 1314. 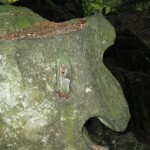 Robert thanked Cormac by gifting him a portion of the famous stone, which was built into the castle wall. Subsequently, the family possessed the castle until the 1600’s and even stood up to Queen Elizabeth I. The then-current McCarthy refused Her Majesty many times with flattery as she tried to gain control of the castle, forcing her to label his words “blarney.” Hence, the name of the stone! “Blarney” seems an accurate name indeed for the stone, which has many claims to fame: as the coronation seat of the first King of Scots; as Jacob’s pillow, brought to Ireland by Jeremiah; as the stone that concealed David when he escaped the King of Saul; and as the stone Moses struck with his staff. Whether the Blarney Stone was once a royal rump roost, whether it has biblical origins, or whether it is, after all, just a stone, it is now a hot spot to visit. making for a pretty decent hike for the ambitious tourist. dungeon had lost none of its threat. 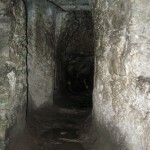 A short and badly eroded flight of stairs led to a damp, dripping passageway that aimed for the bowels of the castle. I didn’t go that far; what at the entrance was a corridor large enough to stand in became, within twenty feet, a crawlspace. Sans a headlamp, rappelling gear, and a wet suit, I decided that I had gone far enough and was content to scuttle back out into daylight, looking over my shoulder as I went to see what dungeon-monster might come clanking up behind. Similarly, the Badger Cave, purportedly a secret route that allowed the McCarthys to escape the wrath of Cromwell (and which, also purportedly, has access to tunnels leading to Cork, Kerry, and Limerick), made for a damp and claustrophobic adventure into the hillside. I didn’t see any trans-Ireland tunnels, but I did meet with other tourists who were reluctant to tiptoe into the dark. sorry for the servants who had to heave kegs of beer, cheeses, and haunches of beef up from the basement – where, it seems, all foodstuffs, including live cattle, were kept – to the main hall (one floor above) or to the kitchen (on the third floor, I think; I lost track). They must have strapped the supplies to their backs, since there was barely room for one person on these stairs! My final thoughts of claustrophobia occurred in the “lady’s room,” a good representative of the bedchambers in the castle. In itself, it wasn’t a bad spot for a bedroom, but the poor damsel had only a two-inch slit to peer out of whenever she wished to see daylight. I suppose the teeny gap kept the rain out, but I would have wanted a spyglass on hand to stick out and observe the goings-on below! Yes, I'm kissing a stone. Why do you ask? 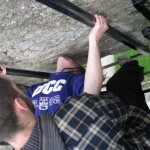 when I leaned back across the gap to kiss the Blarney Stone! One attendant kept a safety grip on all of us stone-kissing tourists while his buddy snapped photos. Once I’d had my turn, I headed on my way, down the stairs on the opposite side and out the exit toward the stable-yard. There, I abandoned my plans for a healthy sandwich, instead indulging sinfully in a caramel, toffee, and chocolate biscuit cake, accompanied by an Irish coffee. Yum! Note: Do not follow my example of beverage choice unless you have already climbed to the top of Blarney Castle. You will not make it. End public service announcement. She's a very rich witch, judging from the pile of coins on her head. the Blarney House, which is unfortunately closed until spring. Instead of touring the house, I wandered through the “Irish Garden,” complete with juniper, ferns, yew, honeysuckle, and foxglove. The path next led to the fern gardens and then to the poison gardens, growing, among other things, nightshade, wolfsbane, mandrake, tobacco, and hellebore. There was even a large cage for a nonexistent cannabis plant! 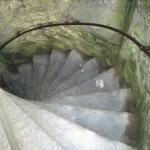 Since I haven’t keeled over from poisonous fumes yet, I will wrap up this rambling and unseemly blog post – clear evidence, I think, that the stories around the Blarney Stone aren’t just myth – by saying that my day at Blarney was a great way to finish the weekend. It was quite an adventure, and I recommend it to all and sundry who find themselves in County Cork. It’s cheap to get in, and, after all, if you say you don’t want to spend a day exploring a castle, I’ll tell you that you’re spouting a bunch of blarney! P.S. My thanks to http://www.authenticireland.com/blarney+stone/ and http://www.blarneycastle.ie/pages/history for the nitty-gritty history.